On Friday, a 13-year old boy was riding his bicycle eastbound on the sidewalk along West 87th Street in Southwest Suburban Burbank. According to news reports, as the boy rode his bicycle across the intersection with Latrobe Avenue he was struck by a dump truck. The dump truck was traveling westbound on West 87th Street and when its driver made a right-hand turn onto Latrobe the young bicyclist was struck at 2:27 p.m. in the afternoon. The boy died as a result of injuries sustained in the crash. “[E]very driver of a vehicle shall exercise due care to avoid colliding with any pedestrian, or any person operating a bicycle or other device propelled by human power and shall give warning by sounding the horn when necessary…” (625 ILCS 5/11-1003.1). This is a tragic loss of a young life as a result of a mistake by the operator of the dump truck. Whether the child was a bicyclist, or it was anyone else crossing the street by foot or bicycle, a motorist has the responsibility to make sure that the intersection is clear before making their turn. Instead, a young boy has lost his life. Our thoughts and prayers are with the family at this difficult time. Keating Law Offices is the premier personal injury law firm representing victims of bicycle accidents in Illinois. Keating Law Offices is the premiere law firm in Illinois that represents victims of bicycle accidents and crashes. Attorney Michael S. Keating is the Chair of the Bicycle Litigation Committee for the National Trial Lawyers Association, the American Association for Justice. The firm is nationally renowned for its experience in handling cases stemming from injuries or wrongful deaths as a result of collisions with motor vehicles. The firm is based in Chicago, Illinois and represents clients throughout Illinois. 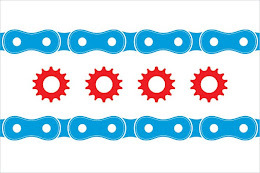 If you have any questions regarding this post or have a question regarding personal injury law, please contact Illinois Bicycle Attorney Mike Keating at 312-239-6787 (Office) or 312-208-7702 (Nights/Weekends). Our staff and operators are available around the clock. You can also email Mike@KeatingLegal.com 24 hours a day, 7 days a week. All e-mails and phone calls are returned promptly. All initial consultations are confidential and free.